The opposition is at a crossroads, while the government faces tough challenges. After a disputed election, Malaysia’s opposition appears to be in something of a bind as to what comes next ahead of the opening of parliament on June 24. On May 5, the Barisan Nasional (BN, or National Front) coalition held onto office in Malaysia's 13th general election, meaning that if it stays in government for the full five year term to 2018, it will—with its forerunner the Alliance Party—top six continuous decades in office. The Pakatan Rakyat (PR*, or People's Alliance) opposition doesn't think that the BN won a free and fair vote, however, and is filing official complaints against the outcome in 25 constituencies which it says were marred by cheating. If the opposition alliance won enough of the seats it is contesting, it would reverse the election outcome – a 133-89 seat win for the BN on a record 85 per cent turnout. In turn, the BN has filed complaints about 21 seats, which if it carried, would return the governing coalition's two-thirds parliamentary majority lost in 2008 elections – an outcome that for the first time spurred opposition hopes that it could make history by beating the BN at the polls. That didn't happen in 2013, however, despite the opposition taking the popular vote on a 51 per cent to 47 margin – another imbalance it says shows the need for a redrawing of some election constituencies, seen as a gerrymander giving the BN an unfair advantage in ethnic Malay majority regions and meaning that on average a BN MP was elected with just under 40,000 votes, while an opposition lawmaker needed over 60,000 votes to make the cut. With so many grievances against what it feels is a political system weighted in favor of the BN, the opposition has taken its campaign against the result to Malaysia's streets, and on Saturday next, the weekend before the country's newly elected legislature convenes, another rally is planned, this time in Kuala Lumpur. 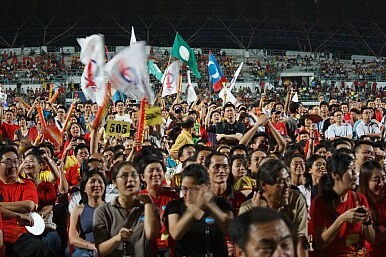 The June 22 event comes after a series of similar rallies protesting the election outcome – known as “Black 505” rallies and each drawing tens of thousands of PR supporters – were held around Malaysia after the result was announced. While the government has not yet resorted to the teargas and water-cannons it has used in previous opposition-linked electoral reform protests, the latest series of protests have seen opposition supporters arrested under harsh sedition laws dating from Malaysia's colonial era. Perhaps such caution is playing into how the opposition will engage with Malaysia's newly elected legislature. Media speculation puts the opposition parties at odds with each other over whether to boycott parliament or not, with opposition leader Anwar Ibrahim's People’s Justice Party said to be considering a boycott, while fellow opposition parties, the Democratic Action Party (DAP) and PAS, Malaysia's Islamist party, are expected to attend. Part of the rationale for attending parliament – aside from adding parliamentary profile to the legal and public protests against the election outcome – is that no-show MPs are vulnerable to having their seats taken from them, reckons James Chin, Professor of Political Science at Monash University. “They are worried that the government will call by-elections if they refuse to take their seats without giving a reason that is deemed acceptable by the speaker of parliament,” says Chin. Parliament could turn out to be testy, given that the weeks since the election have been marred by inter-ethnic slurs, with BN-linked media castigating Chinese-Malaysian voters for backing the opposition en masse. While the election saw the United National Malays Organisation (UMNO) led by Prime Minister Najib Razak win 88 seats, by far the most of any party, the mainly Chinese DAP emerged a clear if distant second, winning 38 seats in parliament. With the main Chinese party in the BN down to just seven seats, the new cabinet announced by Najib Razak features just two ethnic Chinese – out of 57 ministers – an allocation that will surely test the Prime Minister's oft-stated “reconciliation” pleas. Chinese-Malaysians make up around a quarter of the country's 29 million population. Still, the cabinet seems more a politically expedient line up based on the election outcome, rather than a blatant tribal snub. Former Prime Minister Abdullah Badawi was ousted in 2009 by UMNO members angered after the BN lost its two-thirds majority in the 2008 election, so Najib is likely trying to forestall a repeat heave at a party conference due later this year, given that BN won seven fewer seats this time around than under Badawi five years ago. “The PM is keeping his enemies close, and several of the senior cabinet are Mahathir men,” says Chin, referring to outspoken former Prime Minister Mahathir Mohamed, a still-influential figure who spoke before the election of a need to “change horses” should the BN fail to improve on its 2008 result. However, given that Najib’s personal profile and popularity exceeds his party’s or the BN’s, it seems unlikely that he will be jettisoned. “Realistically an UNMO not led by Najib will probably face an even more uphill battle in the coming election,” says Oh Ei Sun, a former Najib aide. Regardless of who turns out when the parliament convenes, or who is prime minister after the next UMNO party conference, lawmakers will have pressing economic concerns to deal with. The BN ran an election campaign based partly on trumpeting its recent economic record, with trade-oriented Malaysia growing at around 5 per cent a year, despite stagnating or slow-moving markets in Europe and the United States. But Malaysia's first quarter growth for 2013 was below expectations at 4.1 per cent, the lowest in three years, according to the country's Central Bank, and well down from the 6.5 per cent posted in the fourth quarter of 2012. It means a tougher economic climate for the BN, which has held off on what Dr. Yeah Kim Leng, chief economist at Kuala Lumpur-based rating agency RAM Holdings, described as “difficult structural reforms,” previously outlined in government programs that the BN hopes will make Malaysia a high-income country by 2020. While Malaysia's ever-divisive politics could stymie BN reform ambitions, so could economic conditions outside the country. Much of the growth Malaysia has managed to achieve seems to be down to domestic demand, in turn massaged by pre-election spending and cash handouts by the BN government. More worrying perhaps is that Malaysia posted its lowest trade surplus since the 1997-98 Asian financial crisis – reflecting reduced exports of crude petroleum, electrical and electronic products – according to the International Trade and Industry Ministry. If the economy stutters, and growth slips again, it could be difficult for the BN government to bring in other reforms that run against the grain of its pre-election populist-sounding handouts and pay raises, such as new taxes. A key challenge for the prime minister, according to Dr Yeah, will be to persuade a “skeptical public on the need for reforms such as subsidy rationalization, the introduction of the consumption-based Goods and Services Tax (GST) system, [and] curtailing government spending to meet deficit targets.” It all adds up to a rocky post-election path ahead for the Southeast Asian stalwart. Simon Roughneen is a Southeast Asia-based journalist. * Corrected from PKR. Thanks to reader LH. Malaysia’s Sedition DebateThe Everyday Activists Behind Malaysia’s Democracy StruggleMalaysia's New Political TsunamiMalaysian Politics Get NastyHow Will Malaysia’s Najib Razak Fare in 2018?